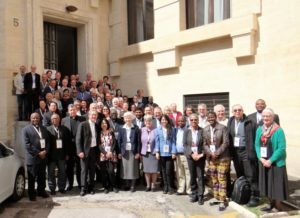 who met at the Vatican on 4 & 5 April for a joint gathering, “Path of Nonviolence: Towards a Culture of Peace.” organised by the Vatican’s Dicastery for Promoting Integral Human Development and Pax Christi International’s Catholic Nonviolence Initiative . Members of the CNI roundtable on the Power of Nonviolence, which was co-convened by Pat Gaffney and Rose Berger, were able to give testimony to the effectiveness of nonviolence – these included Pietro Ameglio from Mexico, Kanini Kimau from Kenya, Rania Murra from Palestine and Jean Baptiste Talla from Cameroon. 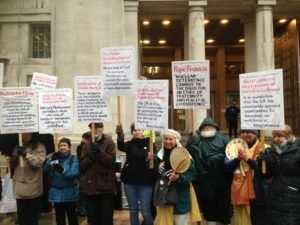 Another cold, wet Ash Wednesday but this did not stop more than a hundred people gathering for prayer at the Ministry of Defence in London to call for a change of heart away from policies of security based on the threat and use of nuclear weapons. Similar events took place in Liverpool and Glasgow . 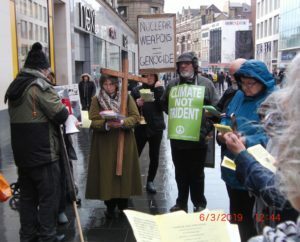 This was the 37th year of Ash Wednesday witness to nuclear war preparations, supported again this year by Christian CND and the London Catholic Worker. Among those joining were religious sisters, members of Justice and Peace Links, the Columban Faith & Justice team, Westminster Justice and Peace, Kent Christian Peace Activists and members of the Nipponzan Myohoji Buddhist Order. The liturgy took place in the context of a nation that still places nuclear weapons at the heart of its defence policy and with a Prime Minister who has said she would press the nuclear button. 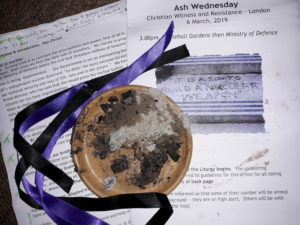 Since 1982 Christians have gathered on Ash Wednesday at the Ministry of Defence in London, to pray for peace and a conversion of hearts and minds, away from nuclear war preparations, the destruction caused by nuclear testing and the wasted resources that are invested in nuclear weapons. On the same day , Pax Christi Liverpool will hold a service in Liverpool City Centre, beginning at 12 noon in the bombed out St Luke’s Church. In Scotland the Glasgow Catholic Worker will meet at 2.45 at the South Gate at the Faslane Naval Base near Helensburgh. 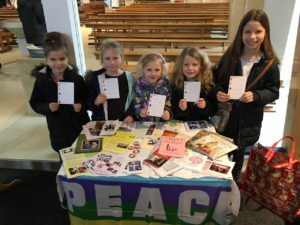 From the Isle of Wight to Durham, Pax Christi members are excelling themselves in preparing to mark Peace Sunday on 20 January. Prayer cards, information leaflets, liturgy booklets, scripts for talks and children’s activity resources are flying out of the office to ensure that the World Peace Day Message, “Good politics serves peace” is shared within the Catholic community in England and Wales. Pax Christi’s education worker, Aisling Griffin has produced a special Assembly for schools, reflecting on politics and peacemaking . One parish has created a script which confirmation candidates will use to highlight the Pope’s message. In a Southampton parish, an afternoon meeting has been arranged with Fr Gerry McFlynn of Pax Christi and the Irish Chaplaincy leading a discussion on Blessed are the Peacemakers. In York, Middlesbrough Justice and Peace Commission have organised a meeting with speaker Chris Cole. Chris is Director of Drone Wars UK and a member of Pax Christi Executive Committee. In Harpenden a gathering has been arranged where Pax Christi’s Pat Gaffney will speak on the theme Pope Francis Calls us to be Peacemakers – Pax Christi responds. Pax Christi members and staff will speak in parishes in Leeds, Isle of Wight, Leicester, Barnet, North London, Central London, Abingdon, Liverpool, Kent, Oxford,and beyond. Peter Hickey who coordinates member support in Pax Christi said: We have seen such great feedback this year from our members who have all been encouraged to respond to the Popes Peace Day Message. Whether it’s through ordering from our online shop or downloading materials, members are getting in touch to tell us about events in the planning – we in the office continue to be so encouraged to see our members working to promote peace in their own communities. 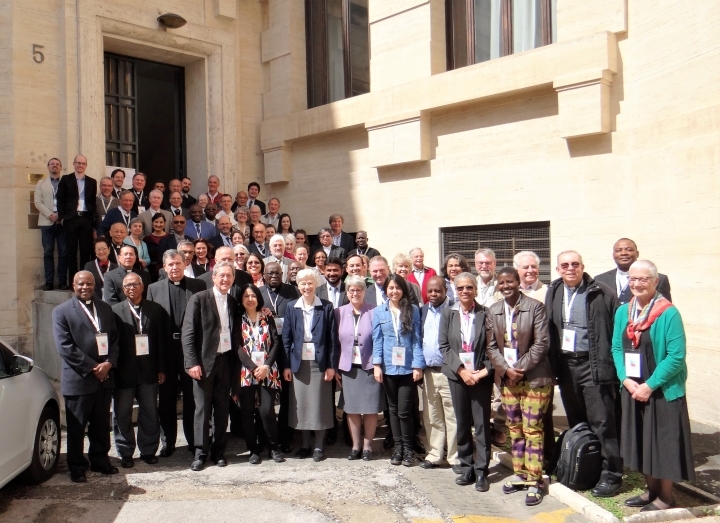 In his letter to parishes Archbishop Malcolm McMahon, National President of Pax Christi said: Working nationally, with a team of 4 staff and volunteers, a huge amount is achieved through the outreach work and resources produced by Pax Christi. Many parishes take special collections on or around Peace Sunday – this support is so important to enable the work to continue. 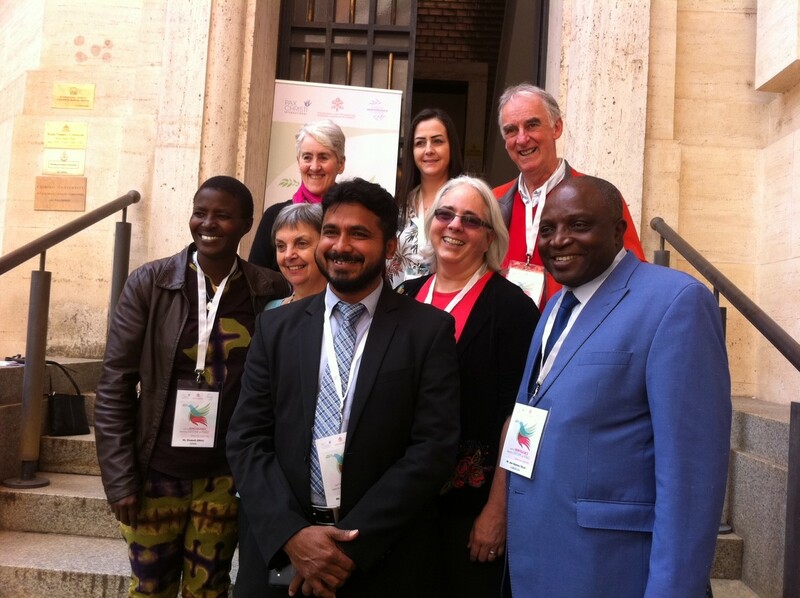 Because of Pax Christi’s faithful promotion of the World Peace Day Message since 1967, England and Wales are among the few countries who seek to educate and inform the Catholic community of the theme in accessible and creative ways.